To Cite: Sarmadi M R, Zandi B, Nouri Z, Gholamali Lavasani M. Information and Communication Technology and Knowledge Management in Higher Education System, Interdiscip J Virtual Learn Med Sci. 2017 ; 8(2):e60876. doi: 10.5812/ijvlms.60876. Given the importance of knowledge management at university, most scholars believe that the key to the success of knowledge management is the capacities information and communication technology provides in this field. Thus, the present article aims to identify effective factors of information and communication technology on knowledge management in higher education. Research methodology: this is a qualitative study conducted by content analysis and semi-structured interviews with academics from state universities in Tehran as well as objective sampling in the year 2016. Using an analysis of data resulting from semi-structured interviews and a review of research, background effective factors of optimal use of communication and information technology were identified. Then, they were classified into main and additional categories. Results from encoding and categorical content analysis suggest that hardware and software infrastructures, access to academic databases and electronic networks, access to new knowledge research, retrieval, storage, exchange and processing technologies, and mastery over related software are regarded as effective factors of information and communication technology on knowledge management in the higher education system. Each category covers several subsets. Conclusion: in order to apply the findings of the present research in practice, it is suggested that the establishment of knowledge management system approach be valued in academic environments. As we know, universities and research institutes constitute social academic communities that play a vital role in creating and transmitting scientific knowledge (1). Advanced development in the world of information technology has provided the necessary infrastructure to support the development of new organizational forms (2). Information and communication technologies can represent a source of competitive advantage for an organization (3). Knowledge management plays a key role in high education (4-7). Knowledge management (KM) is concerned with the processes or practices of creation, acquisition, capturing, sharing, and usage of knowledge, wherever it resides, to enhance learning and performance in organizations (8). Academics, as centers of knowledge production and spread, highly require knowledge management (9, 10). Informational technological changes have transformed universities and colleges; systematic information networks, knowledge, and sciences have provided opportunities for knowledge production, spread, and sharing with the help of information and communication technology (11). Knowledge is dynamic, since it is created in social interactions amongst individuals and organizations (12). Jashapara (13) states, knowledge management includes influential learning processes combined with knowledge creation, organization, and exchange. Proper use of technology and cultural atmosphere leads to incensed organizational intellectual capital and improved performance. Jung et al. (14) defined knowledge management as the process of applying and providing skills and expertise in organizations which are supported by information technology. Most researchers believe that knowledge management is successful thanks to the capacities which information technology provides in the modern time (15). Information and communication technology (ICT) provides potential means for improving knowledge work productivity, for example, through helping knowledge workers perform certain routine (ie, non-value-adding) tasks faster and through supporting knowledge sharing among professionals (16-19). Modern technologies enable organizations to implement knowledge management system, store, and share unstructured information (20). They also facilitate the integration of disorganized knowledge so that most activities can be done in the shortest time (21). Studies conducted on knowledge management divide it into tacit and explicit knowledge (4, 10). According to Nonaka and Takeuchi, tacit knowledge exists in the mind of individuals (12), while explicit knowledge is available in organizations and can be easily processed by computers, transferred electronically, and stored in databases. It is shared among individuals as an official and systematic manner very easily (22). The interdisciplinary nature of knowledge management had a big part in providing different views and epistemologies of knowledge management (23). These differences might result from information-based, technology-based, and culture-based outlooks (24). Regarding when information-based outlook is dominant on the management level, two models have been developed for implementing the knowledge management system (19). 1- Network model in which communicative technologies and guidelines are used to link knowledge holders to knowledge users. 2- Reservoir models which use information technology to acquire, organize, store, and distribute objective organizational knowledge. Hansen et al. state that there are at least two strategies for knowledge management: codification strategy and personalization strategy (25). Encoding strategy is concerned with organization whose competitive advantage stems from re-application of encoding knowledge and emphasizes on the creation of researchable reservoirs for the storage and retrieval of encoded knowledge (26). Personalization processing style stimulates knowledge learning and creation through collective interaction with experts and colleagues. Based on the latter strategy, knowledge is formed not only through face-to-face interaction but also through electronic communications such as networks of individual (27). Today, networks are considerably used for knowledge interaction and scientific research. Fluid and network-based technologies are used in social media in order to create dynamic backgrounds through which people can share and recreate produced contents (28). Arntzan et al. (29) emphasized on proper and effective use of information technologies in universities for improving knowledge-based organizational learning and web technologies like social networks, wikis, and blogs for supporting knowledge management plans. The study by Ulka et al. (30) highlighted the important role of information and communication technologies in relieving dominant challenges of technology and knowledge sharing, exchange and expansion in higher education. The study by Jones et al. (31) focused on the development of an online portal for linking academic researchers in order to fill in the gap of sharing and knowledge accessibility by using management methods. Meatal’s research (32) indicates the impact of information systems on academic staff’s scientific activities and the role of information technology on knowledge management and value production. Adhikari (33) viewed the lack of technological thought formation as the most important challenge in universities. Sveiby and Simons (34) expressed that a cooperative atmosphere is the main factor in the process of knowledge creation. According to Liebeskind et al. (35), social networks act better than organizational arrangements in providing knowledge resources in universities. The present study aims to identify effective factors in optimal use of information and communication technology for academic staff’s knowledge management in higher education. The present research is conducted by following a qualitative approach and using content analysis method across state universities in Tehran. As is generally agreed, content analysis is widely used for defining certain concepts and words in a text or a set of texts. A text includes books, chapter(s) of a book writings, interviews, talks, titles, newspaper headlines, and historic documents. A researcher used the content analysis method to analyze the existence of concepts or relations between words or concepts (36). Data collection method includes semi-structured interviews with scholars and academic experts are conducted by the objective method. In this method, a researcher chooses samples which suit her (his) stated goals and data collection process continues until a theoretical saturation is reached (37). Thus, a sample which could provide the most information on the research area was chosen among academic staff members of state universities in Tehran. These members were engaged in the field of knowledge management and had been awarded as associate professors or professors in the year 2016. Table 1 shows some features of scholars and staff members who participated in interviews. 1) Both the expertise and knowledge of university and research scholars and educational institutes’ teachers could be benefited from simultaneously. 2) Those selected for the sample had long been involved in research and scientific activities so that they had adequate knowledge of research subject and, also, had publications in this area. Main ideas of semi-structured and individual interviews with scholars were determined after research background and theoretical bases had been studied. As the findings of our study, main and additional effective factors of knowledge management were identified. All the interviews were done individually and later were transcribed. Each interview lasted between 60 and 90 minutes. For ethical considerations, interviews were done after receiving voluntary consents from participants. In addition, participants could leave interviews when desired. Interviewees were assured that names and contents of interviews were kept confidential. After having gathered necessary qualitative data, main and additional categories were derived from open and axial encoding processes on resulting data from detailed interviews with key scholars. The priority of each factor was determined based on the frequency of mentioned content analysis used. In order to analyze data carefully, concepts were studied through encoding, direct transcription of interviews with key scholars, and analyzing documents line by line. They were then analyzed into statements and expressions which are called raw data. After that collected sentences and expressions were continuously compared and classified into similar sentences and expressions. Next, concept (s), which was referred to in texts, was extracted. In order to ensure that all concepts are extracted, sentences and expressions were studied and compared from the beginning to the end of the texts. After common conceptual codes were extracted and repetitive instances were removed, theoretical bases were used to compare conceptual codes and to identify concepts. Finally, main and additional categories were research processes which are given in Figure 1. To make sure that our research is reliable and results are accurate, we went through the following stages: (38) at first, results were examined by the participants in the interviews. They reviewed categories and commented on them. Secondly, research advisors and supervisors examined findings and expressed their opinions. For the purpose of our study, effective factors on the optimal use of information and communication technology for academic staff members’ knowledge management in higher education were identified by analyzing data from semi-structured interviews and reviewing research background. It should be noted that data were classified and encoded after semi structured interviews. In the following, each factor is explained in Tables 2 and 3. Hardware infrastructure 1. Updated hardware infrastructure, 2. Support from hardware systems, 3. Website design and update, 4. Communicative infrastructure development, 5. Internet network support, 6. Financial support for purchasing, 7. Equipped universities with communicative and information technology tools. Necessary software 1. The development of support hardware; 2. Updated software; 3. Necessary software maintenance; 4. Interactive software on web; 5. Groupware; 6. Interactive tools and multi-channel programs. Access to new technologies 1. Technology for easier access to information resources; 2. Technology as a facilitator of knowledge creation; 3. Knowledge exchange technology and facilitator of team work; 4. Related technology to storage and retrieval; 5. Technology for integration, filing, and the transfer of knowledge. Results from encoding and categorical content analysis showed that 6 categories or factors of communication and information technology are highly important in state universities. In table 3, the frequency and samples of interviews will be brought along with interviewee codes. Because of the high volume of interviews, one or two interviews are mentioned for each category. Hardware infrastructures: As can be seen from the first row of open encoding table, hardware infrastructure was highlighted by all scholars for knowledge support, exchange, organization, and application. 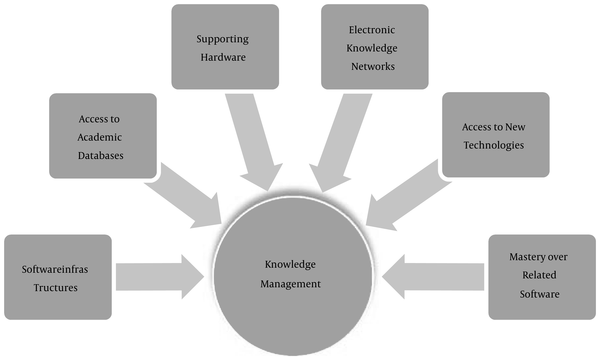 Here are some quotes from scholars: “one of the effective factors of knowledge management is the use of updated hardware infrastructures for supporting activities related to knowledge management”, “support from hardware systems, internal network, internet, website design, and updated website influence the knowledge creation by academic staff members”. Applied software: results from information analysis of interviews indicates that all scholars agree that necessary software are important for supporting knowledge creation, exchange, organization, and application. As stated by one of the scholars: “given the important role of information technology in knowledge management, modern and useful software should be broadened to facilitate and accelerate knowledge management processes”. Another scholar focused on updating software for knowledge management. Access to university and academic databases: the main purpose of higher education is to grow and develop researches in universities and higher education institutions. Communication and information technology play a vital part in this respect. As is seen in the third row of open encoding table, online access to university and academic informational platforms and the use of the latest scientific information are effective on knowledge creation. Electronic knowledge networks: the 4th row in the encoding column suggests that electronic knowledge networks are one main indicator of knowledge creation, exchange, and sharing. Knowledge networks are a suitable tool for connecting scholars and experts within organizations in order to exchange knowledge. The following statements show how much scholars emphasize on the importance of this element: “electronic knowledge networks make it possible to identify specialized people to share and exchange knowledge”, “by connecting academic staff members who have common scientific interests but are geographically scattered, knowledge networks enable quick and easy information exchange and knowledge transfer among research and academic centers.” Other scholars remarked that communication and information technology facilitates cooperation with other academic staff members whose knowledge is important to them. “Or” networks enable scientific actors to accumulate their knowledge in order to gain superior knowledge in their fields of interest and to avoid overlapping measures. Access to new technologies: the 5th rows of encoding column show the significance of access to new technologies for knowledge search, storage, retrieval, exchange, and processing. Scholars expressed that new technologies have facilitated and accelerated information indexing, integration, filing and sharing, “technologies related to knowledge retrieval and storage are known as a revolution in organizing and expanding information”, “communication technologies enable users to access required knowledge, especially for experts”, “technologies which facilitate teamwork and software which connect scholars provide the opportunities for content sharing, cooperation, interaction, and relationship across the world”. Mastery over related software: the last row of encoding column is mastery over related software. According to scholars, communication and information technology cannot facilitate knowledge orientation process in organization, but instead is a very important factor of recognition, awareness, and individuals’ ability in using these technologies. In this regard, scholars stated that “given the rapid development of communication and information technology, updated specialized skills in using technology influence the application of technologies”, “powerful human capital in universities is the main factor of knowledge creation within organizations”, “mastery over related software can positively influence knowledge management”, “universities need to provide educational courses on new skills of information technology”. As mentioned above, after collecting data from semi-structured interviews, we initiated qualitative data analysis process. Later, data were filtered and encoded based on research subjects. After encoding, redundant data were removed and data were filtered. Finally, categories which objectively represent a more general category were aligned and classified into 6 factors of communication and information technology related to knowledge management in higher education. These categories include supporting hardware and software infrastructures, access to university and academic databases, electronic knowledge networks, access to new technologies for knowledge search, storage, retrieval, exchange, and processing and, lastly, mastery over related software. The final product of semi-structured interviews with scholars were shown in Figure 2. The primary purpose of the present paper was to identify those factors of communication and information technology which are related to knowledge management in higher education. Results from the study suggest that supporting hardware and software infrastructures, access to university and academic databases, electronic knowledge networks, access to new technologies for search, retrieval, storage, exchange and processing of knowledge, and mastery over related software are known as the most important and effective factors of communication and information technology on the knowledge management of academic staff members. Below, each factor will be discussed and compared. Results from our study suggest that academic scholars regard hardware infrastructures as one of the most effective factors on the knowledge management of academic staff members because every single communication and information technology program must be implemented on the grounds of sound and rigid infrastructures. Thus investments on infrastructures should be done regarding their importance as the main drive and key infrastructures of the development of communication and information technology in universities. This result is consistent with the results from pang et al. (5) and photo (39) on the importance of infrastructures on optimal knowledge management. According to our findings, another effective factor on the knowledge management of academic staff members in universities is the importance of necessary software for supporting knowledge creation, exchange, organization, and application. In this respect, modern useful software which facilitate and accelerate knowledge management processes should be expanded. This finding is also consistent with studies conducted by Kang et al. (40), which had emphasized on the importance of suitable communicative systems for knowledge transfer and sharing, our finding is, also, consistent with studies by Boughzala and Dudezert (41) and Kietzmann et al. (28) on the importance of social software in knowledge sharing. As is derived from the results, a key indicator of knowledge management is using electronic knowledge networks for knowledge creation, exchange, and sharing with colleagues. Knowledge networks are the tools which link experts and scholars within organization in order to exchange knowledge and eventually achieve their desired goals. Majority of scholars agreed that cooperation and participation in academic activities are the key factors of academic staff members’ empowerment. This implies that the development and improvement of knowledge management depend on the improvement of communication and interactions among academic staff members. This finding is confirmed by Nory B.Jones et al.’s study on linking academic researchers for filling the existing gaps of knowledge sharing and accessibility in universities (31); it is also supported by studies led by Sveiby and Simons (34) on cooperation atmosphere and knowledge creation and Orlikoski (42) on the positive role of communication networks in more effective cooperation among academic staff members. Yong and Wan (43) stated that social interactions are centered around interpersonal behavioral interactions, value sharing and transfer, assumptions, attitudes, and recognition. They believed that social interactions rely on informal gatherings, discourses, social events, collaborative thoughts, networks and consultation plans. Nealson used the concept of knowledge embedment to explain the role of communications in knowledge creation process (10). Thus, members, in knowledge networks, converge from distant geographical locations with the help of communication technologies and information enters networks from every corner of the world. Networks link members in both real and virtual manners and create a suitable background for the production of knowledge. Knowledge management in networks depends on cooperation, collaboration, and teamwork skills. They become possible through knowledge socialization and the conversion of tacit knowledge into explicit knowledge. Networks play a big part in linking individual and forming academic coalition and unions and eventually knowledge creation (42). The 5th rows in encoding column necessitate access to modern technologies for knowledge search, retrieval, exchange, and processing. According to scholars, technology opens the way into empowerment and the expansion of interactions among groups and organizations. It enables individuals to overcome the limitations of time and space. Besides, it expands the area and depth of access to information as well as facilitating knowledge creation, exchange, and sharing. Scholars clearly stated that those technologies which facilitate teamwork and software which link scholars provide opportunities for cooperation, interaction, relationship, and sharing of contents of any kind. It should be emphasized that information technology acts as a supporter of knowledge management and helps individuals gain suitable information. Communication technologies enable users to access their desired knowledge and communicate with each other, particularly with experts, collaboration technologies provide necessary conditions for teamwork. For instance users are able to work on shared documents both simultaneously and at different times. This is of particular value for interactive group members who have an important role in knowledge production (1). This finding is supported by several others. Researchers: Artzen et al. (29) on the importance of effective and useful application of information technologies in universities for improving knowledge-based organizational learning and web technologies such as wikis, blogs, social networks and so on for supporting knowledge management plans; Ulka (30) on the important role of communication and information technology in relieving dominant challenges of knowledge and technology sharing an exchange in higher education; Mittel (32) on the positive role of information systems in scientific activities by academic staff members and the influence of information technology on value production and knowledge management; Kulakl and Mahony (44) on the importance of technology in knowledge management. According to Zwari et al. (45), the shortage of communication and information technology which represents a technical problem, hinders knowledge sharing. The last row of encoding column is concerned with mastery over related software. Almost all scholars claimed that communication and information technology cannot facilitate knowledge orientation process in organization by itself. Instead, individuals need to have acquired underlying recognition and abilities of applying those technologic. As far as technological infrastructures are concerned, rapid development of communication and information technologies, as well as fear from inability to use them make individuals unwilling to improve their specialized skills, thereby they will lose their contact with their surrounding communication and information technology. Training contributes to the knowledge management process as well as knowledge creation, storage, transfer, sharing, and application within organization (46, 47). Therefore, the first step to the application of technology is to teach how to use communication and information technological software. - Developing appropriate and updated hardware and software infrastructures based on the latest existing technologies. - Developing communication facilities such as electronic knowledge networks in order to recognize researchers in other academic centers and to share and exchange knowledge. - Developing data platforms and providing access to modern academic resources for staff members. Given the indisputable role of information technology in knowledge creation, managers need to develop technologies and modern software which contribute to the establishment of knowledge management processes. Regarding the importance and influence of modern technologies on knowledge management, we suggest that academic staff members should be trained about related technologies and updating their specialized skills in using those technologies.